A team of researchers from the RIKEN Center for Emergent Matter Science (CEMS) in Japan has identified unexpected dynamic properties of a type of light wave called evanescent waves. These surprising findings contrast sharply with previous knowledge about light and photons. The study carried out in the Quantum Condensed Matter Research Group (CEMS, RIKEN, Japan) led by Dr. Franco Nori is published today in the journal Nature Communications. Energy, momentum, and angular momentum are the main dynamic characteristics of physical objects. It is well known that light propagating as an electromagnetic wave or photon carries momentum along the direction of the wave's propagation, and that this momentum is independent of polarization. In addition, light can carry an intrinsic angular momentum, called spin, that is proportional to the degree of circular polarization (helicity), and aligned with the propagation direction. The RIKEN team analysed the momentum and spin of evanescent electromagnetic waves – a type of light waves that travel close to the surface of material objects and whose intensity decreases exponentially, rather than varying sinusoidally, from the interface where they were formed. 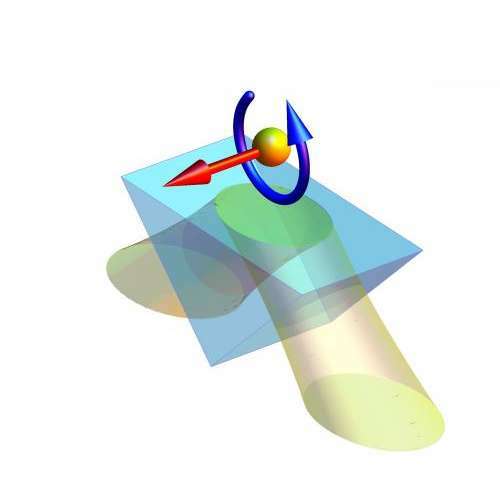 Surprisingly, the researchers found that evanescent waves carry momentum and spin components that are orthogonal to the direction of wave propagation. Moreover, the transverse spin turns out to be independent of polarization and helicity, while the transverse momentum is proportional to the wave helicity. "Such extraordinary properties, revealed in very basic objects, offer a unique opportunity to investigate and observe fundamental physical features, which were previously hidden in usual propagating light and were considered impossible," says Dr. Konstantin Bliokh, first author of the study. "In addition to a detailed theoretical analysis, we propose and simulate numerically four novel experiments for the detection of the unusual momentum and spin properties of evanescent waves via their interaction with small probe particles," he adds. These results add a new chapter to the physics of momentum and spin of classical and quantum fields, and predict a number of novel light-matter interaction effects involving evanescent waves.